The interaction of myosin and actin constitutes the basic mechanism of muscle contractile activity. 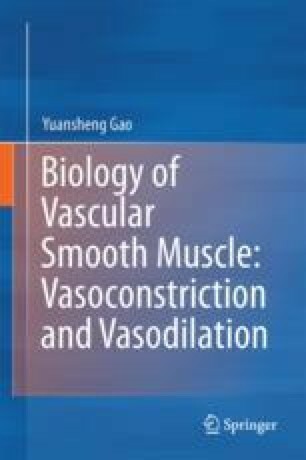 In smooth muscle cells (SMCs) including vascular smooth muscle cells, this interaction is predominantly regulated by the phosphorylation of the regulatory light chain (RLC) of myosin. The RLC is phosphorylated by myosin light chain kinase (MLCK) and dephosphorylated by myosin light chain phosphatase (MLCP). Therefore, the contractility of SMCs is determined by the relative ratio of the activity of MLCK vs. that of MLCP. During a contractile response, MLCK is activated by calmodulin-bound Ca2+. Meanwhile the activity of MLCP is suppressed by protein kinase C (PKC) through the 17-kDa PKC-potentiated inhibitor protein (CPI-17) and by Rho kinase (ROCK). The varied activities of these major signaling pathways endow SMCs with different contractile profiles such as phasic and tonic contractions to meet the diversified physiological requirements.